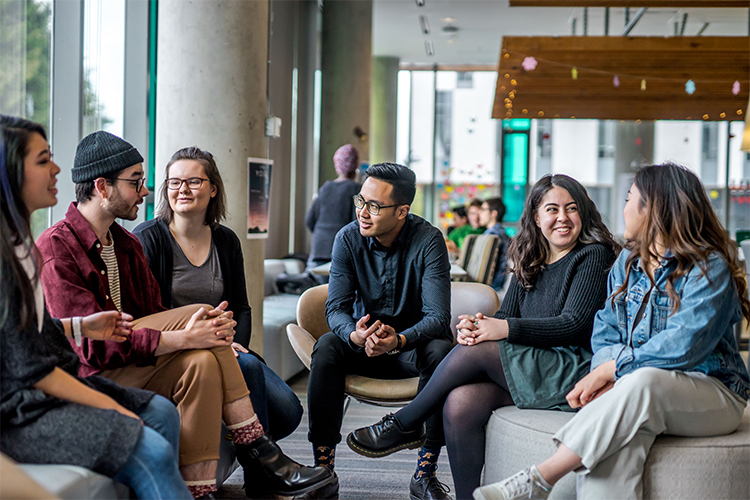 Whether you’re facing a long commute or a taking a quick bus ride to UBC, feeling like part of the university community can be challenging if you don’t have a home base on campus. UBC Collegia are spaces where commuter students can fully experience life at UBC. Each Collegium on the Okanagan campus has comfortable furniture, dedicated workspaces, and a kitchen to make you feel right at home. 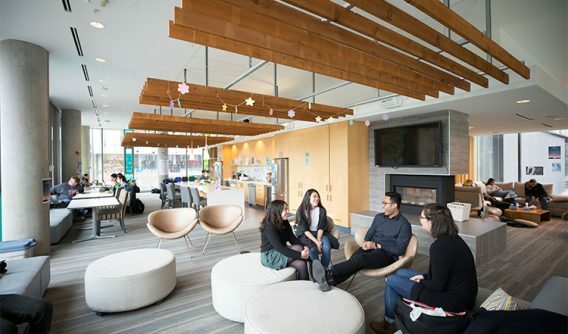 There are three different Collegia spaces on the Okanagan campus where you can relax, eat lunch, do schoolwork, or spend time with friends between classes. Each Collegium is staffed by senior students who can answer your questions, refer you to campus resources, and help plan activities and events. Also known as the Junior Collegium, this space is the perfect place for new-to-UBC students to find community on campus. Come here to meet other students from your program – or cross paths with people from completely different faculties. Also known as the Senior Collegium, this space is traditionally a quieter spot for students to study, work on group projects, or unwind. Come here to enjoy a peaceful coffee break or get a head start on your assignments. You don’t need to be an international student to visit the Global Collegium. If you’re interested in discovering new cultures and sharing your own, you’re welcome here – no passport required! Come here to meet UBC students from across Canada and around the world. No registration or membership is required to use the Collegia on the Okanagan campus. If you’re interested, stop by for a visit. UBC Collegia spaces on the Vancouver campus offer plenty of space for you to kick back and relax. If you’ll be commuting to campus, you’re part of the majority: more than 75% of students on UBC’s Vancouver campus bike, drive, or take transit to campus. You may be wondering where you’ll be able to warm up your lunch, relax between classes, or meet people. UBC Collegia on the Vancouver campus provide all of this and more. Each space has a kitchen, comfy couches, and friendly advisors who are happy to chat and help you settle into life at UBC. There are also lots of activities designed to connect you with on-campus services, faculty members, and peer support. There’s no cost to join UBC Collegia, but spaces are limited. If you’re a first-year commuter student on UBC’s Vancouver campus and you’re interested in Collegia, let us know.